If you feel the need for some epic motivation. If you want to up your skills and spice up your practice sessions. If you're committed to being the best damn singer you can be (at least for a month). THIS CHALLENGE IS FOR YOU. Let's do this. The best thing about doing a challenge is getting involved with other badass challengers. Post what you're up to and how you're finding it on social media so we can follow along! 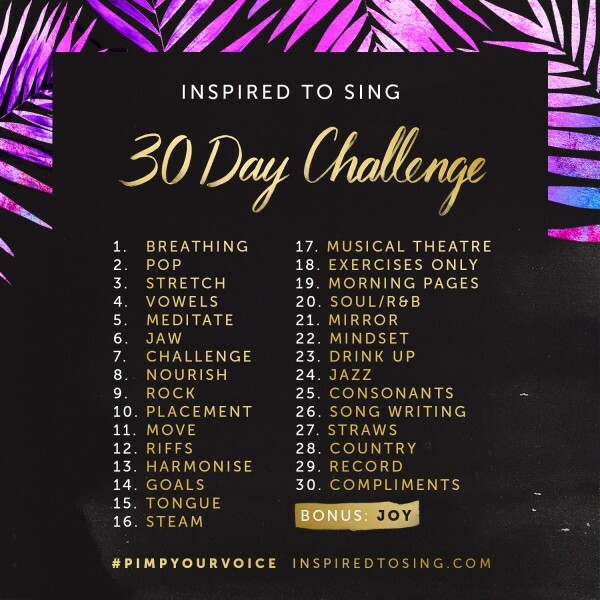 Add the hashtags #30daysingingchallenge and #pimpyourvoice and if you'd like to - tag me in your posts. WANT IN? Pop your details below! I hope you have an absolute ball doing the challenges and as I said, keep in touch, let me know how you're going.